Sofia Largo brings ancient feeling that your feet walk on 2,000 years of history. Guests of Sofia now have the opportunity to walk along the original flooring on the main Roman road existing for centuries. This street is entered from the East Gate of Serdica, whose entrance is in the subway across the former Party House. Then the street continued southeast to Philippopolis (now Plovdiv) and was one of the most important roads in the Roman Empire – Via Diagonalis or Via Militaris. The excavations recovered part of the colonnade of the wide street. The space under the Largo covers 4850 square meters of existing underpasses of Serdica eastern gate of the ancient city, the central underpass with the temple “St. Petka”, the space between the boulevards “Dondukov “and” Todor Alexandrov “and under the square in front of the Central Department Store. The area under the boulevard “Maria Louisa” has an area of ​​3150 square meters and covers the area between the Central Subway with temple “St. Petka of the Saddlers’. It is still not clear whether in the foreseeable future remains of the palace of Emperor Constantine will emerge, then surely we can go on the streets of his neighborhood, known in fourth century as Konstantinoviya. Around the main street you can see the reserved residential fragments from the Roman town. In the earth are found genuine parts from drains, plumbing and underfloor heated homes. The ancient inhabitants of Serdica were heated with hot mineral water, which squirting in several places in the city center and the central piping system was built by lead pipes. Let’s remind that the Imperial Baths are beneath the Rotunda. There are still visible devices that have been used as “heating” – with warm air and for the ventilation of large premises. The remains of ancient dwellings suggest that once they were rectangular and with yard in the middle and the sides were lined with columns and arches. Probably built in the IV-VI century, but were inhabited during the Middle Ages also. Because one of the mosaics that has been under apse of the church, parts of the temple were moved to the other side of Largo. The pieces of the puzzle were removed, restored and returned back to their place. The excavations found 60-70 skeletons because behind the church, built on the ancient building, the funerals were taking place. The archaeologists believe for another building it had a fountain in the courtyard, but it was not preserved. 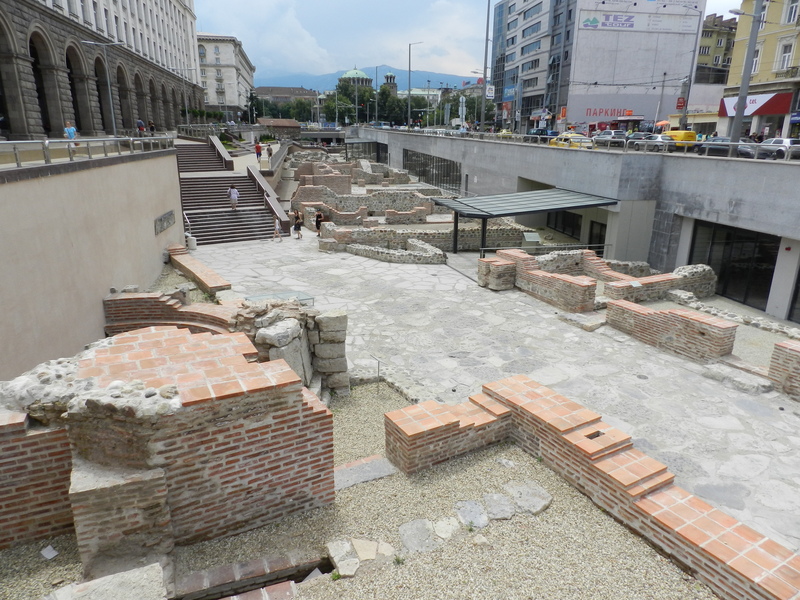 Archaeologists so far have revealed several churches whose ruins have emerged during excavations for the Sofia Metro. Two of them are early Christian, one is perhaps the oldest in Serdica – this suggest both building materials and construction itself. The most exciting is that there are preserved parts of the frescoes, although not clear whether the figures are kings or saints since the heads of the figures have not been preserved. Two other churches from the late Middle Ages – the smaller, probably from the fourteenth century, was adjacent to the “Church St Petka of the Saddlers’. In the courtyard there is another cemetery, and it was acting in XVII-XIX century, it may be that it was built back in XIII-century. In the neighborhood during XVI and XVII century there were about 40-50 Christian churches active during the Ottoman period in our history. The “Serdika” complex includes two streets from the Roman period (IV-VI century), remains of residence, seven residential buildings, multicolored mosaics. It is believed that under “Sveta Nedelya” should be the ruins of the district administration when Serdica was the heart of the inner Dakiya. Four lifts lead to the underground streets of Largo. Two of the lifting facilities are located directly beside the Rotunda on Square “Independence.” One of them is in front of the Central Department Store. Stage for theater, concerts and other events with space for 1,000 spectators is formed just below the main glass dome covering the Largo between the Presidency and the Council of Ministers. The back of the stage, which is outlined with a darker color of the tiles, are the remains of ancient Serdica. Give yourself this ancient walk. 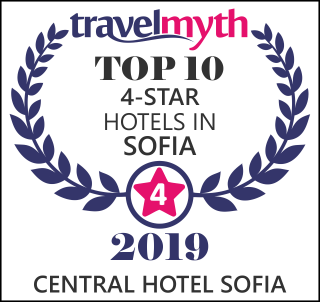 Located only 5 minutes walk from Central Hotel Sofia. What else can you see within immediate proximity to the hotel, read here.